Nano- and Microfabrication for Industrial and Biomedical Applications, Second Edition, focuses on the industrial perspective on micro- and nanofabrication methods, including large-scale manufacturing, the transfer of concepts from lab to factory, process tolerance, yield, robustness, and cost. 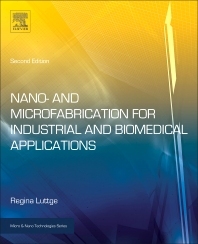 The book gives a history of miniaturization and micro- and nanofabrication, and surveys industrial fields of application, illustrating fabrication processes of relevant micro and nano devices. In this second edition, a new focus area is nanoengineering as an important driver for the rise of novel applications by integrating bio-nanofabrication into microsystems. In addition, new material covers lithographic mould fabrication for soft-lithography, nanolithography techniques, corner lithography, advances in nanosensing, and the developing field of advanced functional materials. Luttge also explores the view that micro- and nanofabrication will be the key driver for a "tech-revolution" in biology and medical research that includes a new case study that covers the developing organ-on-chip concept.